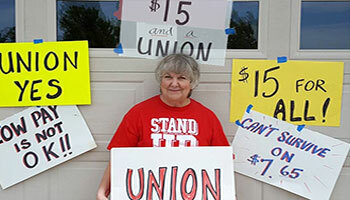 Mary Bay, pictured, and her husband Retired Midwest Territory General Vice President Alex Bay were arrested last week during a “Fight For $15” protest in Kansas City. Retirement is widely imagined to be a time of rest, relaxation with travel, hobbies and grandchildren expected to take up many of the hours previously spent on careers, commuting and hurried coffee breaks. Retired Midwest Territory General Vice President Alex Bay apparently never got that memo. Still active and involved in the causes he spent a lifetime fighting for, Bay, 78, and his wife Mary were arrested last week in as part of the nationwide day of protests for a $15 minimum wage and the right to join a union. Blocking a busy intersection in downtown Kansas City, the Bays were among the more than 100 activists arrested, handcuffed and charged with failing to obey police orders. The protesters were jailed overnight before being released on bond. The Kansas City action was one of more than 300 rallies and protests around the country demanding higher pay for fast food and health care workers who struggle to survive on the current federal minimum wage of $7.25 per hour.